The SAS/Explorer column property editor lets you change the values of certain attributes of a column; but only one column at a time. It takes a few clicks and context menu choices to raise the edit dialog. There has to be a better way! The R line command was used to R-ename a variable and change its properties of format, informat and label. Have a nice trip? 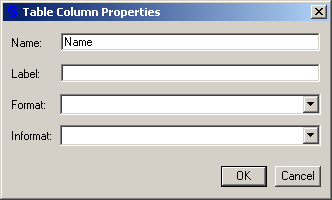 Welcome back to the present... and a new way, a column properties editor built with SAS/AF technology. The editor will run in any SAS v9+ interactive session (and probably v8, not tested) and does not require SAS/AF to be licensed. 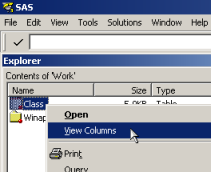 The column editor presented in the column tab is reminiscent of the SAS Version 6 VAR window. 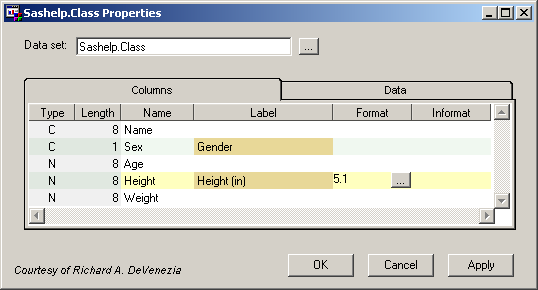 All the columns are shown, and any number of their properties may be edited simultaneously in the resizeable dialog window. A data tab is provided to allow a quick check of the effects of any changes applied. This editor was first made available as part of action set devenezia-1. Using techniques discussed in "SAS Explorer Actions", the editor can be invoked by selection from a data members SAS/Explorer context menu. This page was last updated 01 December 2006.